Having a problem with space in your home office? Learn some clever tips and ideas to maximise space and make your office look bigger. 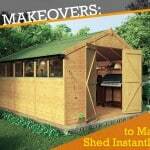 You find the idea of working in a garden office fresh and interesting. But you enter your own nicely built outdoor office shed and find it uncomfortably cramped and confining. What gives? Your office may be lacking the space it deserves. Space is an essential element when it comes to home office. Not only does it help you work with more ease, but it potentially affects your work productivity. Here we’ll share with you eleven clever and practical space-maximising ideas for your small garden office. Set your work aside for a moment (or a whole day) and get your creative self ready for a project make-my-office-room-look-bigger. Step one in creating more space in any room is to declutter. As they say, less means more. Taking out the unnecessary stuff out of your working area is an absolute must. If it has nothing to do with your work, best to place it somewhere it can be more useful. Then strive to keep your dedicated place of work as neat and simple as possible every day. Limit the floor space to furniture and accessories that you need most in the office. Desk and tables, yes. Bookshelves, could be. Rugs, maybe not. If you needed to store in some stuff, use an overhang or wall mount instead to free up the space on the floor. Pictures and artworks all over the wall. It’s as if the room is busy and crowded. We do understand your need to cherish memories of your loved ones and your great time with them. Or your wish to express the artistic side of you. But in trying to make a room less limiting, it will do well to sacrifice a few photos or accessories off your wall, and keep it simple. Creativity comes in different forms, with some even playing with functional element. 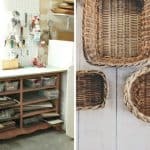 Home DIYs like storing items are brimming with such artistic+practical features. So you could take that as an inspiration for your personal office space. Use vertical height storage systems above your desk or in the corner, multi-purpose chest that doubles as a seat for clients or visiting friends, and shelves not only for books but for file folders and accessories as well. Just remember to tuck in all your office items neatly when storing them in or out of sight. Office furniture often take up a lot of space. So select only the pieces that will serve the job for you. You can custom-build a chair or table that will fit perfectly to the size and style of your room. If you want a couch, opt for the multi-purpose or drawer-enabled styles. For coffee tables, choose the foldable ones that could be stored away when not needed. Too often, your pick of furniture are just too large to pass as a space-saver. But with some arranging hacks, those bulky things can be a little less of a problem. Place stand alone bookcase against the wall. Some smart garden office features an L-shape floor area to allow an extra space for the same equipment. Never let any of your furnishings block the pathway, nor place smaller pieces in almost every corner of the room. Put up one focal point instead, perhaps your beautifully arranged desk, to draw your or anyone’s attention. And keep the rest of the room to a minimum accessory. A well-lighted place does not only help reduce work stress, but it also makes a room look visually spacious and clean. Inviting natural light to flood your room is always the best way to lighten up a place. 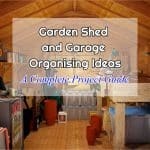 With garden offices, this task won’t be too difficult to achieve. Make use of the large and corner windows by pulling up those blinds to let the sunshine (and the garden scene) blend with your office interior. If you are to use curtains, hang in the lighter or translucent fabric. Bright colours work a lot of wonders in making a room look bigger. 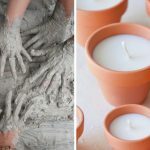 It is because lighter hues reflect natural light, making a space look more open and feel airy. Soft shades of blue, green, and purple are cool colours so they work well in keeping a place bright and peaceful. Warm colours like orange and yellow tend to make you think of sunshine so they make a perfect roomy effect in any space. You can never go wrong with the sweet and simple white, too. Pick any or play with a combination of these colours when painting your walls or choosing a wallpaper design to create a more expansive room. Using mirror is a classic and stylish way of letting in more light into your room. Place them strategically where it can bounce off light into your office. Aside from bouncing light, mirrors reflect the rest of the surrounding, creating an illusion of depth. So if you’re thinking about accessorising a wall or bringing in stuff to your office, go for the more stylish piece like mirrors. Garden offices are usually prefab with a height just enough to accommodate an adult person (and yes, because of garden buildings restrictions, too). So to make that headroom work for you, avoid bringing in tall furniture as they make the ceiling look lower. And to create an impression of higher ceiling, long curtains can do just the trick. Choose the ones that closely fit from the ceiling down to the floor. And see how it heightens the look of your office. Some garden offices come in single or multiple room designs. If the area seems too small, create sections in the building like a mezzanine. Use it as an extra space for work or for other personal uses like storage of your favourite collection, sleeping quarter, or play area for the kids. Make use of the exterior too by placing an overhanging roof just above the doors for an instant patio and coffee area. This way, you wouldn’t have to feel secluded in the room. And you physically make more space for your office, too. Space will never be an issue after you’ve done some or all of these space-maximising ideas. Find the best way to accommodate more free area in your office room that will redound to a more productive working environment for you. Do let us know how you find this home office project after going through the list. Or share us your own clever tips to make a room look bigger by commenting below.